US dad Matt Sooter shared the intimate moment online of his two children a day before his four-year-old daughter, Adalynn 'Addy' Sooter died from a type of brain tumour on June 3. The young girl from Arkansas, was diagnosed with the deadly illness in 2016, and her dad had been keeping family and friends up-to-date with news of her treatment on the Facebook page, Hope for Addy Joy - Fighting DIPG. 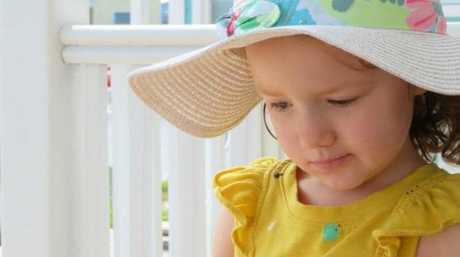 Four-year-old Addy bravely fought brain cancer for over a year before losing her life earlier this month. Picture: Facebook. "He doesn't want to leave her side"
In the heartbreaking photo, Addy looks ill but is grasping her six-year-old brother Jackson's arm while he places a hand on her forehead. Dad Matt wrote a lengthy caption accompanying the photograph detailing the pair's close connection, and Addy's failing health. "A little boy should not have to say goodbye to his partner in crime, his play mate, his best friend, his little sister," he wrote on June 2. "This isn't how it's supposed to be. But this is the broken world we live in." "He doesn't want to leave her side and we won't make him." The grieving father also said Addy's symptoms had gone downhill rapidly over the past day-and-a-half. "While we still see short instances of our girl she can no longer eat or swallow without difficulty and she's sleeping most of the time now. Most likely she doesn't have much time left." "She passed from this life to the next just as she had lived: stubbornly but also peacefully, and surrounded by family. She wasn't in any pain at the end. "That in itself is a blessing because she suffered so little at the end." To donate to help improve survival rates visit curebraincancer.org.au. This story was originally published on Kidspot and has been republished with permission. Brain cancer in Australia: The alarming statistics about brain cancer in Australia today.